BONN, Germany (Reuters) - Deutsche Post DHL Group on Thursday forecast profit growth for this year that lagged analysts' expectations, but played down concerns over global trade, saying more complex supply chains could in the near term benefit its business. In an industry seen as a bellwether for the global economy, U.S. rival FedEx Corp jolted investors in December with a steeper-than-expected cut in its 2019 profit forecast, warning of weakening freight demand as the global economy slows. 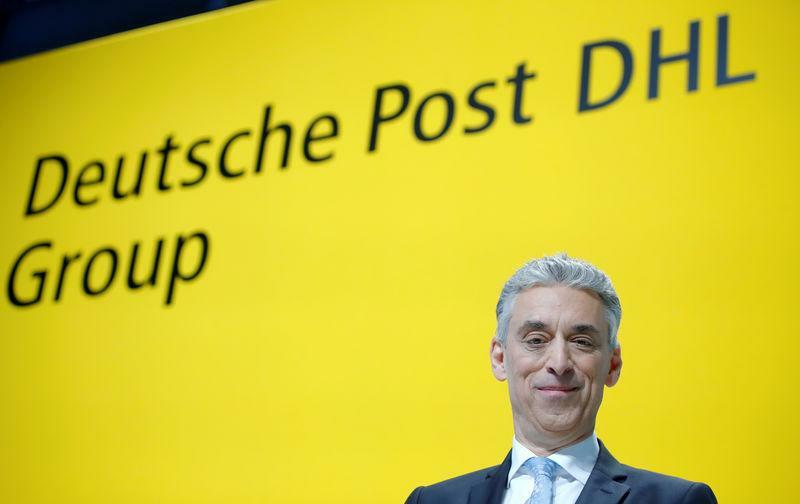 But Deutsche Post Chief Executive Frank Appel said he was not worried, saying the business had a broad base both geographically and operationally that made it resilient even if global economic growth weakened. "We have not seen any signs of a noticeable slowdown on the horizon," Appel said. "The fundamental growth from globalization and digitalization will continue." FedEx executives said they had noted a sharp slowdown in Britain due to uncertainty over the country's departure from the European Union, Germany's economic contraction, protests in France and a cooling of the Asian economy. Appel said however that disruptions to trade such as a possible "hard" Brexit could even benefit the company in the short term as supply chains became more complicated, although protectionist moves would be negative in the long term. "Complexity is good for our business. We are very good at managing complex logistic streams," he told a news conference. Deutsche Post DHL said last month it had hired hundreds of workers to deal with new customs procedures expected to be imposed when Britain leaves the EU. The German postal and logistics group reported a 5.1 percent rise in fourth-quarter sales to 16.9 billion euros ($19.11 billion), versus analysts' forecast for 16.65 billion, while operating profit was in line at 1.1 billion euros. Deutsche Post said operating profit should rise to between 3.9 billion euros and 4.3 billion euros in 2019, and confirmed its guidance for the metric to reach at least 5 billion by 2020. The 2019 guidance compares to average analyst forecasts for 4.1 billion euros, according to Refinitiv data, but includes a 400 million-euro gain from the disposal of its China supply chain business. "As a result, the midpoint of the underlying guidance range is 8 percent below consensus," wrote Jefferies analysts. Shares in Deutsche Post, which have fallen by a quarter in the last year, had turned slightly positive by 1130 GMT after falling more than 1 percent in early trade. The group issued a profit warning for 2018 last June and started a restructuring program at its Post - eCommerce - Parcel (PeP) division, including an early retirement program, as well as splitting its post-and-parcel delivery division into a German and an international unit. It could take several months until the measures had a positive impact on its figures, but they should help profitability for the year and longer term, Appel said.